Understanding the global carbon cycle provides scientists with vital clues about the planet’s habitability. It’s the reason why the Earth has a clement stable climate and a low carbon dioxide atmosphere compared to that of Venus, for instance, which is in a runaway greenhouse state with high surface temperatures and a thick carbon dioxide atmosphere. One major difference between Earth and Venus is the existence of active plate tectonics on Earth, which make our environment unique within our solar system. But the atmosphere, oceans, and Earth’s crust are only part of the story. The mantle, which represents 75% of Earth’s volume, potentially holds more carbon than all other reservoirs combined. Carbon – one of the essential building blocks of organic life – is taken into Earth’s interior by subduction, where it drastically lowers the melting point of the solid mantle, forming carbonated melts (carbon-rich molten rocks) in the shallow mantle, fuelling surface volcanoes. Carbonate minerals may also be transported much deeper into the Earth, reaching the lower mantle, but what happens next is uncertain. Answering that question is beset with challenges – conditions deep within the Earth are extreme and samples from the mantle are rare. The solution is to recreate those conditions in the lab using sophisticated technology. Now a team of experimental geoscientists from the University of Bristol have done just that. Their results, published open access in Earth and Planetary Science letters, uncover new clues about what happens to carbonate minerals when they are transported into the mantle via subduction of the oceanic crust (where one of Earth’s tectonic plates slides below another). Their findings have uncovered a barrier to subduction of carbonate beyond depths of around 1,000km, where it reacts with silica in the oceanic crust to form diamonds that are stored in the deep Earth over geological timescales. Dr Drewitt and his team subjected synthetic carbonate rocks to very high pressures and temperatures comparable to deep Earth conditions of up to 90 GPa (about 900,000 atmospheres) and 2000 degrees C using a laser-heated diamond anvil cell. They found that carbonate remains stable up to depths of 1,000-1,300km, almost halfway to the core. Under these conditions carbonate then reacts with surrounding silica to form a mineral known as bridgmanite, which forms most of the Earth's mantle. The carbon released by this reaction is in the form of solid carbon dioxide. As the hot surrounding mantle eventually heats up the subducted slab, this solid carbon dioxide breaks down to form superdeep diamonds. Dr Drewitt adds: “Eventually the superdeep diamonds could be returned to the surface in upwelling mantle plumes, and this process could represent one of the sources of superdeep diamonds that we find at the surface and which provide the only direct evidence we have of the composition of the deep earth. 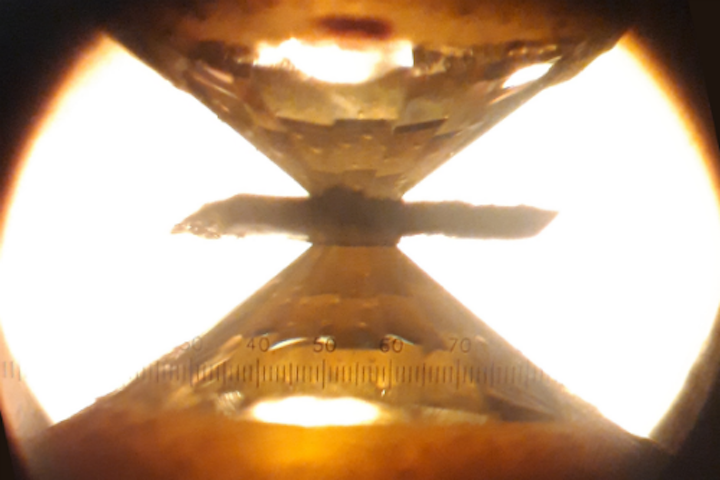 The team used a diamond anvil cell to generate pressures equivalent to those found at these depths, loading samples under a microscope into a pressure chamber drilled out of a metal gasket which is then compressed between the gem quality, brilliant cut diamond anvils. The crystal structure of those samples was then analysed using x-ray diffraction at the UK synchrotron facility in Oxfordshire. Dr Drewitt now plans to apply these high pressure and high-temperature experiments along with advanced computer simulation techniques to other minerals and materials, adding: “As well as carbon, there is potentially several ocean's worth of water transported deep into the mantle, and when released this will induce melting of Earth's upper and lower mantle.